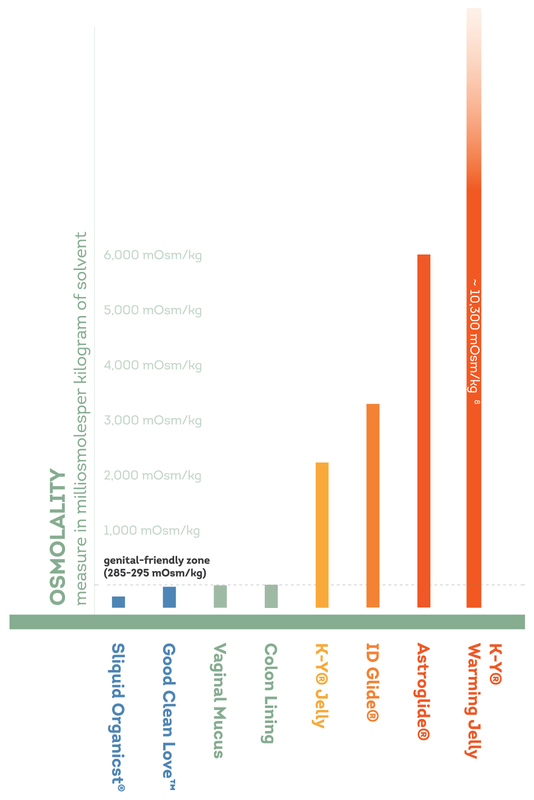 Osmolality – the measure of dissolved particles per unit of water in a solution or serum (sometimes referred to as the concentration). The osmolality of a lubricant is important because the epithelial skin layer or the body’s natural mucus is constantly trying to maintain homeostasis, or an equilibrium of osmolality. Endocrine disruptors – chemicals that interfere with the natural function and balance of the endocrine system. Xenoestrogens – chemicals that mimic estrogen, side effects caused by xenoestrogens are called oestrogenic effects. pH – is the measure of a liquid’s basicity or acidity on a scale from 0-14, 0 being most acidic and 14 being most basic. 1) Thomas, Pat. “Behind The Label: K-Y Jelly.” Ecologist. 24-2. http://www.theecologist.com. 2) Bakhshi, Rahul P. et al., “Hyperosmolar Sexual Lubricant Causes Epithelial Damage in the Distal Colon: Potential Implication for HIV Transmission.” The Journal of Infectious Disease. 195 (2007):703-710. Web. 3) Abusuwaa, Raed, Deborah J. Anderson, Richard A. Cone, Timothy Hoen, Thomas R. Moench, XiXi Wong. “Vaginal microbicides: detective toxicities in vivo that paradoxically increase pathogen transmission.” BMC Infectious Diseases. 6 (2006):90. Web. 4) Ayudhya, Kunjara Na, et al., “Is Wetter BetteR? An Evaluation of Over-the-Counter Personal lubricants for Safety and Anti-HIV-1 Activity.” PLOS ONE. 7 (2012):1-14. Web. 5) Adriaens, Els et al., “Mucosal Irritation Potential of Personal Lubricants Relates to Product Osmolality as Detected by Slug Mucosal Irritation Assay,” Sexually Transmitted Diseases 35 (2008):512-516. Web. 6) Moench, Thomas R., et al. “Microbicide excipients can greatly increase susceptibility to genital herpes transmission in the mouse.” BMC infectious diseases 10.1 (2010): 331.